(April 22nd 2011 Tsingtao）The Annual Summit of China Green Companies 2011& Inauguration Ceremony of China’s Top 100 Green Companies launched today in Tsingtao. It was a great convention that has been attended by insightful and innovative business leaders, academic authorities, NGO representatives and mainstream journalists. The Annual Summit of China Green Companies is sponsored by China Entrepreneur Club and focus on the harmony between nature and humans as well as the protection of Earth, homeland of the humans. In succession to last year’s initiative in calling for “Green Evolution: Governments and Enterprises”, “Saving water, saving life” has become the theme of this year. What is new is that the organizer has adopted the international practice of an annual summit of “carbon neutral” by the way of tree planting to absorb CO2. The Annual Summit of China Green Companies authorize China Green Carbon Foundation(CGCF) to implement the “carbon neutral” project. The later is the first national public funding foundation motivated at combating the climate change by increasing carbon sinks through tree planting. CGCF assigned Beijing Gloriam Climate Technology Consulting Co.Ltd, a certified carbon accounting company, to estimate the total carbon emission from the meeting, inclusive of transportation, accommodation, food and the use of equipment for the more than 800 annual summit participants, which has been calculated at 65.5 tons of CO2-e. LAO NIU FOUNDATION and TNC will fund RMB183, 000 to plant 53 mu of carbon sink forest in HeLinGeEr County in Inner Mongolia in accordance with entrepreneurs’ desire and will be implemented by CGCF. All the carbon generated from this annual summit will be neutralized in the next 5 years. The target of a “carbon neutral” meeting will be realized then. 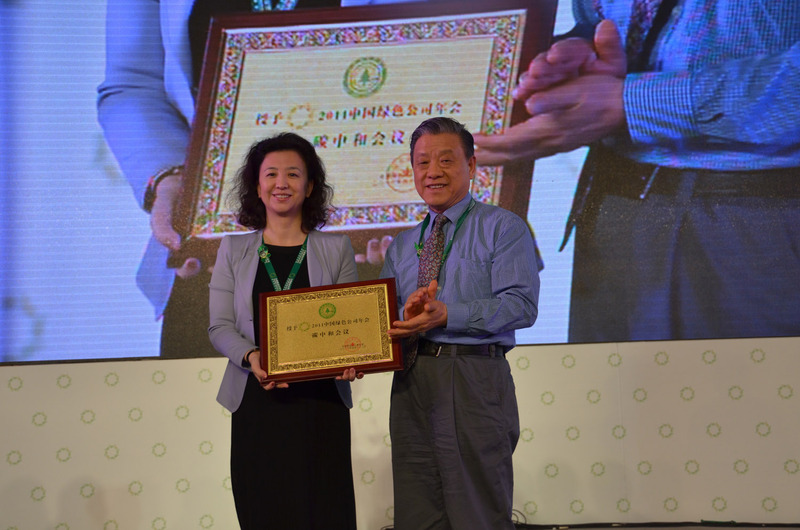 The executive deputy board director of CGCF Mr. LI Yucai, member of the national committee of CCPPC who used to the deputy administrator of State Forestry Administration handed over the plaque of “Carbon Neutral Annual Summit of China Green Companies 2011” to CHENG Hong, Secretary of the China Entrepreneur Club. CGCF has been China’s most authoritative organization in arranging public benefit “carbon neutral” activities. Previously, it has implemented two carbon offset initiatives for the UN Tianjin Climate Change Conference and that of the Third China International Forum of Ecological Civilization and Green Competition. In response to journalists’ question of why CGCF had been chosen to carry out the Annual Summit’s “carbon neutral” activity and what was the features of CGCF’s “carbon neutral” project, CHENG Hong, Secretary of the China Entrepreneur Club, elaborated that CGCF has established a series of standards in carbon sink production, accounting, monitoring and verification as well as registration which are based on the China’s practical conditions and are in line with the international practice. Furthermore, the conservation of biodiversity and water resources as well as the improvement of local ecological environment has been specified in details. All these have squarely been the focus of public benefit initiative of our Annual Summit this year. Meanwhile, CGCF guarantees that every ton of carbon in the carbon sink account will be corresponding to a plot of forest. This plot of forest will not only absorb the carbon but also provides employment opportunities and increase income for the farmers working in afforestation and forest management, thus undertaking the role of poverty alleviation which has always been in the minds of members of the China Entrepreneur Club who have set the target to achieve through the participation of public welfare activities. During her interview on “Saving water and saving life” initiative with www.sina.com.cn , Dr. Li Nuyun, Secretary-general of China Green Carbon Foundation articulates that forest has a direct and close relation with water. The forest can not exist without water and water source can not be conserved without forest. Forest always provides water source and also conserve the water source that the humans can not live without. People say “The higher the mountain, the higher the water source”. This is precisely true because the forests in the high mountains conserve the water source. Dr. Li emphasized that “The forest has multi benefits. It takes in dual functions of mitigating and adaptive to the climate change that will become the significant low cost and economically practical measures in increasing carbon sink and reducing emission”. Planting trees to increase carbon absorption and the protection of forest to reduce carbon emission has been recognized as the important approach in mitigating climate warming and has been incorporated into the agenda of international climate change negotiation. Greatly increase the forest carbon sink has been integrated in the “China’s National Program in Addressing Climate Change” and become one of the three voluntary controlled greenhouse reduction targets committed by the Chinese government, i.e. forested areas will be increased by 40 million hectares and the forest stock volume by 1.3 billion cubic meters by 2020 on that of 2005 level. At the time when China is facing great pressure of emission reduction from the international society, CGCF has established a platform of engagement of low carbon production and low carbon life style for the enterprises and the general public, assisting the enterprises to anchor a windward by taking the lead in carbon reduction activities for the public welfare. This will help foster the carbon sink trade market in China and make contributions to the energy saving and emission reduction to combat global climate change and to the protection of Earth, homeland of the humans. In the exhibition area, Carbon footprint calculator displayed by CGCF caught entrepreneurs’ attention. They have interested in calculating their own carbon emission of their present mission. Some purchased “carbon compensation to eliminate their carbon footprint” from CGCF on the spot. The cooperation between the CGCF and China Entrepreneur Club will succeed in achieving the “carbon neutral” of the Annual Summit of China Green Companies 2011. Promoted by CGCF, the quadruple beneficial policy of “store carbon credit, practice social responsibility by the enterprises, raise farmers’ income and improve ecological environment” has input new ideas in broadening enterprises’ public benefit involvement.